Jets Towing provides swift and affordable medium duty towing services in and around New York. Our fleet of tow trucks and flatbeds are ever ready to assist in the retrieval and recovery of medium sized trucks, dually trucks, Recreational Vehicles (RVs), cube vans, single axle trailers and storage units. Whether your pickup truck has broken down or your RV is stuck in a ditch, we have the equipment and the skills necessary to manoeuvre your asset out of the tough spot and safely tow it back without causing further damage. Our medium duty trucks are available 24/7 to safely transport your vehicle. We have extensive experience in transporting all kind of vehicles from luxury to fleet. Whether you want to transport your vehicle to service station or body shop, with Jets Towing you can be assured it will be transported safely and on time. We use the latest technology and the best possible towing vehicles to ensure that we deliver safe, reliable and smooth recovery for your vehicle. With the industry’s latest towing equipment and professionally trained drivers, we make sure to meet all your medium duty towing and recovery needs. 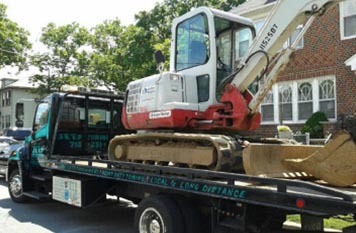 We offer local as well as long distance medium towing services in New York and our fleet is equipped to handle all types of towing and recovery problems. Our experienced towing operators can even skilfully handle vehicles that have rolled over on the road. Jets towing prides itself on its professional work ethic, friendly staff and a firm commitment to customer satisfaction. When you need medium duty towing in Brooklyn, Jets Towing is the name you can count on.